In many places people drive around in cars. From an Amsterdammer’s perspective, these people are potential cyclists. That is because in Amsterdam cyclists dominate the streets. It is widely considered to be one of the best cities for cyclists in the world. When Floris and I moved to Amsterdam, we joined the city’s biking culture and cycled to every destination in town. We sold our cars since they were standing idle and were only costing us lots of money. To us the advantages of cycling are obvious. Bikes – “fietsen” in Dutch – do not emit any CO2 or any other pollutants, which makes them perfect for tackling climate change and air pollution. They also keep you fit, provided a city has the necessary infrastructure to guarantee a biker’s safety. Bikes are fast and easy to park and take up considerably less space on the road than cars, buses or trams, which is great for clogged up inner cities. Most of them are cheap and there’s a bike for every purpose. Therefore, biking is the preferred sustainable transport solution for cities, as it tackles air emissions, health and use of space all combined! Still, in many cities only few people cycle to work, to do groceries or to see friends. What is obvious to us, often amazes foreigners visiting Amsterdam. This article therefore focuses on the benefits of cycling and the infrastructure needed to stimulate a biking culture in your city, while also some challenges are discussed. Cycling is – next to walking – the most sustainable means of transportation. It emits zero CO2 when in use, which makes it climate neutral. Furthermore, it also emits zero NOx, SOx or particulate matter, which positively contributes to the air quality. When different means of transportation are compared in terms of CO2 emissions, gasoline cars stand out on the high end of the scale with 225g of CO2 emission per kilometer per person (when used by one person) (Source: Milieucentraal – Dutch). This provides us with a good indicator of the CO2 emissions saving potential when car drivers shift to bicycles. Riding a bike is a great way of staying fit. The relaxed pace of biking is a like a slow-motion exercise. Even moving around the paddles for half an hour a day already has significant health benefits. These include: prevention of diabetes, burning body fat, cleaning of blood vessels, reducing stress and protecting your brains. This has been proven by scientific research (Dutch). An indirect beneficial health effect is the lack of air pollution from bikes. Whenever someone moves from a car, motorbike or scooter to a bike, NOx, SOx and particulate matter emissions decrease. Seen in this context, supporting a strong biking culture can be a sensible policy when local governments need to enforce clean air quality laws. Naturally, these health benefits are only relevant when biking can be done safely at all times. And there’s where infrastructure comes in. When in Amsterdam, you’ll certainly notice the sheer amount of bikes. In 2015, there were actually more bikes (881,000) than people (821,000) (Source: Amsterdam – Dutch). All these bikes move around quickly and safely because of the cycling infrastructure and the cycling culture working together. The cycling infrastructure invites more people to safely use bikes. Bike lanes are everywhere, clearly marked and very often separated from the streets. When kids learn to cycle at a very young age, they, become very capable cyclists when they grow older. However, this wasn’t always the case in Amsterdam, and the change didn’t happen by chance. Seeing images from a few decades ago, when the city was choked with cars, really illustrates that point. Although cycling in Amsterdam has a long tradition (as American Pete Jordan describes in his book), in the 1970-ties the residents took some very specific steps to get to where they are today. The short film “Bicycle Anecdotes From Amsterdam” (in English; credits: Street Film) nicely illustrates a foreigner’s view on the city’s biking culture. When Pete Jordan was asked why he left America his answer is “Because I saw 927 bicycles in 20 minutes”. While that is nothing special to a Dutchman, it apparently is to an American. The video explains this story of two sides very nicely. On one side the advantages of cars are explained: technological “progress”, economic growth and convenience for those who can afford to buy cars. On the other side their disadvantages become clear: air pollution, public space is taken away and traffic safety conditions worsen. The key for change in Amsterdam came from a grassroots cyclist movement, assisted by a coordinated public effort to demand policy change. The result is the infrastructure we see today. 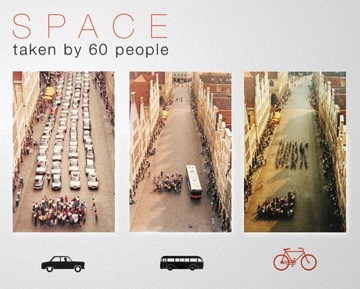 The use of space by cars in cities is a fundamental assault on public space, as nicely illustrated by the picture below. Moving people from the car to the bike offers a great opportunity for policy makers to use the public space for different things. Examples could be more bike lanes, planting trees, stimulating urban food gardening, or creating playgrounds for kids. In Amsterdam, the city policy makers have tapped into the popular biking culture – and further strengthened it – with the “Amsterdam loves bikes” campaign. 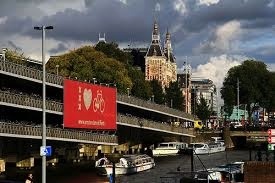 The city expresses its support for biking in posters and flags, such as this one (whereby the three vertical Xs are a play on Amsterdam’s flag). The city has developed large-scale, free-of-charge bike parking at key locations. Perhaps one of the most visible icons of this policy is the multi-layer “bike parking garage” (fietsflat) near Central Station, with 2500 parking spaces for bicycles. Imagine how much space a parking garage for that many cars would take up! Bikes need repair, which is naturally a local activity. 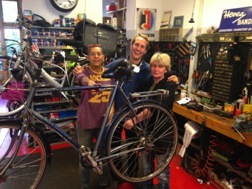 In Amsterdam, bike repair shops are on almost every street corner. Our favorite in our neighborhood has great service and a great name, too: FreeWheel. Two friendly ladies run the shop. They are very capable, reliable and quick and deliver excellent service. They also sell second hand bikes and accessories. There’s a bike for every purpose. 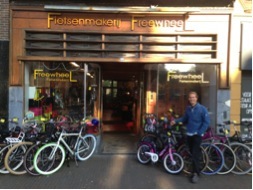 There are bikes for kids, race bikes, bikes with crates or bags, cargo bikes (“bakfiets” in Dutch), tourist rental bikes, electric bikes, foldable bikes, and many more. Personally, I prefer a simple bike with a crate, which comes in handy when grocery shopping and transporting stuff to the boat. The cargo bikes are really popular amongst families. They are used to take young kids to day-care or school, for doing (lots of) grocery shopping or even for moving furniture. Electric versions are getting more popular too. They run on lightweight batteries that can be removed easily and recharged at home, using renewable energy of course. For tourists, rentals are ideal. There are plenty of good ones in central Amsterdam and renting a bike is surely a great idea when visiting Amsterdam, although we do advice novice bikers to pay close attention to pedestrians, cars and fellow bikers. It is not always wise to copy Dutch bikers (they can seem quite reckless, but most of the time they know what they are doing). It is not all good news, there are also some challenges to biking. 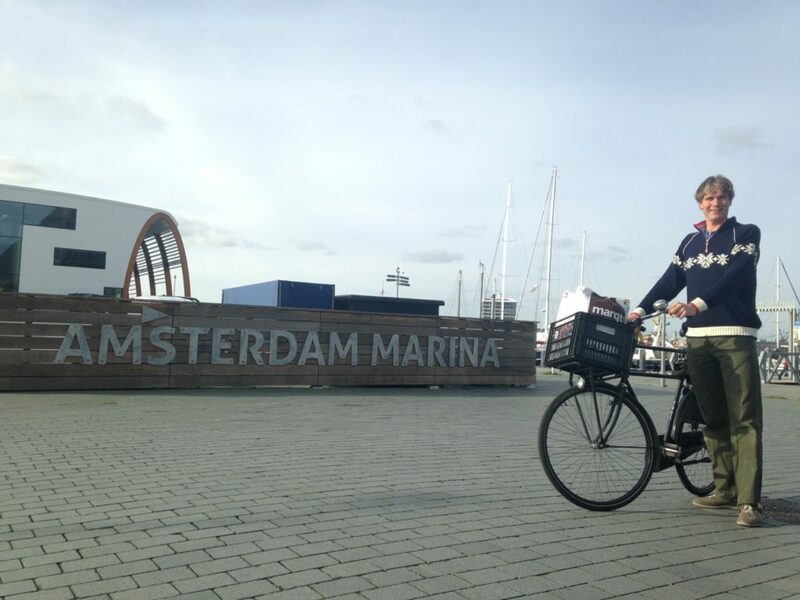 To start, the weather in Amsterdam isn’t always favourable to an outdoor activity such as cycling. However, as the saying goes “there’s no such thing as bad weather, there’s only bad clothing”, so you can prepare for it. And whenever possible, timing your bicycle ride is easy with the local rain radar, which predicts the rain (and breaks between showers) quite accurately. Is this Amsterdam? 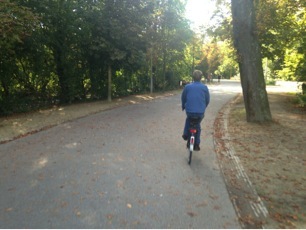 Floris biking in Vondelpark. It doesn’t get better than this. Another challenge is the attempt by scooters to invade the bike lanes, at the cost of bikers’ safety and clean air. It was made possible by a loophole in Dutch transport regulation some ten years ago, but the biking community is close to success in fighting back. Bikers are organized in an NGO called “Fietsersbond”. This organization is leading the campaign to get scooters off the bike lanes and joined forces with Milieudefensie (Dutch charter of Friends of the Earth), which campaigns for cleaner air. The city of Amsterdam is already behind strong measures. However, national law needs to change to make it possible to move scooters off the bike lanes and to the streets. In the autumn of 2015, the national parliament will again look at changing national laws to allow Amsterdam to impose local regulations. Fortunately, scooters were never allowed in the city parks, adding to the truly great biking experience. When cycling through Vondelpark, Floris and I enjoy the sense of nature in every season and fantasize about transforming larger parts of the city into a green biking paradise! When I moved the boat to Amsterdam in 2006 and started cycling, I also stopped commuting by car to work. The moment you’re able to cycle to work, the question becomes: why do I need to own a car? I discovered that cycling and public transport saved me around €5,000 a year on my transportation expenses compared to owning a car. How did I achieve this? The first thing I did was to start using the train network. The trains get you to most places and from thereon local trams or buses can get you to your destination. Sometimes, it’s easier to bring your own bike. 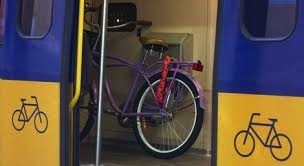 Dutch trains are equipped for it. Floris has a foldable bike, which you can carry for free. Bringing a full-size bike on a train costs €7 for a day. 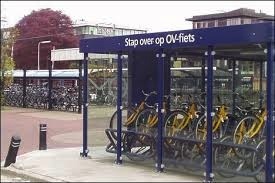 A great addition to the train network is the OV-fiets system. At almost every Dutch train station, you can rent a blue/yellow bike for only €3 a day using a very efficient card-system. To use this service you need a subscription for €10 a year. 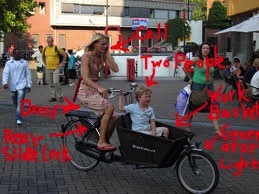 See also the (Dutch only) OV-fiets website. The other change I made was to switch to online purchases. I used to drive around for goods and boat parts. However, almost every store nowadays has a web shop and a home delivery service these days. For a fraction of the costs, I have everything delivered to my home or work address. Sometimes we carpool with friends who drive us somewhere. Besides the additional social time we have together, it’s also more efficient and we all benefit when we share the fuel costs. When I sold the car I thought I would need to rent one quite often. However, that happened only once in 7 years. If we do need a car, we like to use a car that a neighbor offers through “SnappCar”. This site enables car owners to rent out their cars to neighbors, as further described in our article on the Sharing Economy. With oil as the main transportation fuel becoming more and more problematic, and the challenge to drastically reduce global CO2 emissions, bicycles are a great step towards achieving a sustainable transportation system. Furthermore, biking brings significant health & safety benefits, stimulates more conscious living and nourishes a sense of community. While this article focuses on initiatives we have found in Amsterdam, similar initiatives could easily be applied in many other places, provided sufficient people participate. We therefore encourage you to research existing initiatives in your area or set them up. We would be happy to get you in contact with the initiators of some of the Dutch projects, such as the Fietsenbond (which lists similar initiatives and grassroots groups in other cities here) or the City of Amsterdam (which has an English page on their site about biking).